As I sat in my first IEP meeting of the new school year, I got to thinking about my first IEP meeting and how NERVOUS I was for that meeting. Do we have any new teachers out here that will be leading their first IEPs this year? It can be really intimidating to lead these IEPs, so here are a few helpful hints that might make you fill a little better. 1. At the beginning of the year, I make a calendar that tells me the due date of all IEPs and ReEvals. This is super important. You don't want to be overdue on any IEPs or ReEvals. Trust me on this one. 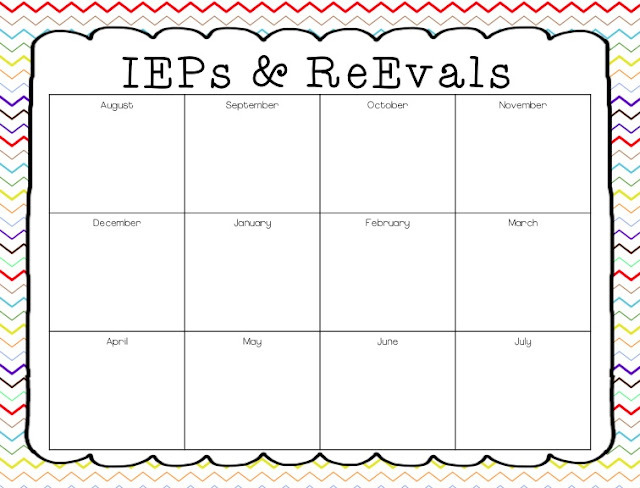 I've made you and editable IEP and ReEval calendar as a freebie. *You will need Powerpoint to use this calendar. Open the calendar in Powerpoint and then click in each month's box. You will be able to type in each box and pick your own font. 2. When you're scheduling IEPs, make a list of all the people that need to be invited and provide services. This list should include people such general education teachers, speech/language pathologists, occupational therapists, physical therapists, school counselors, administration, behaviorists, and most of all the parents. 3. Finding a date for the meeting can be HARD, especially when so many people need to attend. You can go about this two different ways. You can contact the IEP team members and get a few possible dates/times that everyone can meet. Then call the parents and present those dates while asking if any of them are feasible for the parent. Or you can call the parent first , get a good date/time from them, and then contact the team members. Before you schedule the IEP, it's a good idea to ask if there are any certain procedures your school follows for setting up IEPs. Maybe admin is only available on certain days or at certain times. I always try to be super considerate of the parents and their schedules. Parents typically have to rearrange work schedules or find child care arrangements to attend meetings. Plus being nice and flexible with parents will always benefit you! 4. 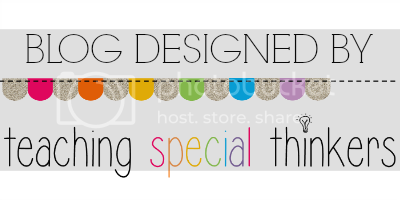 When scheduling IEPs, don't wait till the day before the IEP is due to schedule the meeting. What if mom gets sick and can't come? What if the meeting has to be rescheduled? Always leave yourself enough room that you can reschedule a meeting before the due date. 5. Find yourself a knowledgeable friend at your school that can help you through the IEP process. It doesn't matter if it's another special education teacher, a clerical person who handles IEPs, or admin, but it's always good to be super nice to someone who knows how the IEP process works at your school. 6. Before the IEP, go over all of your paperwork and become familiar with the terminology. Even though I've done tons of IEP meetings, moving to Hawaii made me feel like a brand new teacher again. The paperwork was different, the wording was different, and the order was different. It's taken me several meetings before I've felt like I've gotten my groove back. I promise the meetings will get faster the more you do them. 7. Learn to read upside down. You think I'm kidding, but I'm not. For some reason, I always seem to get put across the table from a parent. Which means they have the paperwork in front of them and I'm reading upside down as we go through it. This is another skill teachers develop over time. 8. Remember to explain things to parents in terms they can understand. Special education has a TON of unfamiliar words and acronyms. It's like a different language. Don't forget that parents may not understand what you mean and sometimes they don't ask. It can be intimidating for them to come into a meeting with so many people who seem like they are experts. 9. When you're writing IEPs, write out the full words for an acronym at least the first time you use the acronym. That's just good practice. You'll learn to read IEPs super quick, but parents don't read all of them like you. I could fill up a report with acronyms, but it would be worthless to read if you don't know what the acronyms mean. 10. It's ok to seek clarification during a meeting if you're unsure of something. This is a team meeting, which means the team gives input. If you're not sure about something, ask the admin or the LEA during the meeting. 11. What if things get heated or parents are upset during a meeting? It's perfectly ok to stop the meeting and reconvene at a later time. Sometimes people need to do more research, take a breather, or think about different plans/programs. 12. Most importantly, remember that your student is someone's child that the parent loves. This meeting isn't just about your student that you deal with for so many hours a day. This meeting is probably one of many the parent has already sat through or will sit through in the future. It's more than just a job to them. Some parents are super knowledgeable about their child's disability and services. Some parents are scared to death of their child having a disability and what this can mean long-term. I've sat through many meetings, especially initial evaluations, where parents have cried. Being compassionate towards parents and realizing this meeting is really about them and their child will go a long way towards having parents on your side. I hope these tips were helpful. Remember, you can do this and it gets easier!